This house in Perros Guirec on the stunning Pink Granite coast, sleeps up to 6 people, has spectacular sea-views and is the perfect place for a family holiday. There is an additional ensuite double bedroom downstairs which can also be added. 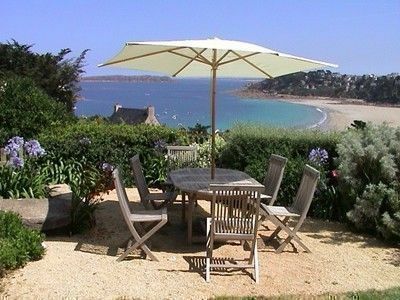 This extremely spacious and comfortable house sleeps up to 6 people and is situated within a five minute walk of the lovely beach of Perros-Guirec on Brittany’s pink granite coast. There is an additional double ensuite bedroom downstairs which extends the accommodation to 8. There is an extra charge for this. All 3 of the upstairs rooms have sea-views and both reception rooms have french doors opening onto the garden with its wonderful view of the sea and beach. The main reception room is open-plan and is comprised of a lounge area with tv and fire place, dining room, bar and kitchen. The adjacent reception room which has double height ceiling and a reclaimed fire place is a good place to relax and escape from the children (or whoever). During the day much of the time tends to be spent in the garden where there are steamer chairs to recline on and table and chairs for outdoor meals. Perros-Guirec is on Brittany’s Pink Granite Coast. The beach of Trestraou in Perros-Guirec is considered to be one of Brittany’s finest. The sand is beautifully soft and the swimming is safe for children. There are several shops, cafes and bars next to the beach, while a two minute drive leads to the main town area and also to the port on the other side of the town. One of the main attractions of Perros is the old medieval church in the centre of town. There is a good market every Friday morning. If you fancy a change from Perros beach, then head for Landrellec a nearby preservation area of unspoilt beaches and beautiful coastal walks. As an alternative to the beaches, the medieval towns of Lannion and picturesque Treguier with its famous cathedral, are good places to visit. The famous coastal path running from Perros-Guirec to Ploumanach is just a five minute walk away and offers stunning views of the pink granite coast. There are some spectacular rock formations to be seen further along the coast, most notably in Ploumanach, Tregastel and Trebuerden, all of which also have good beaches. Ferry, either from Plymouth to Roscoff or Portsmouth to Saint Malo. We are about an hours drive from Roscoff, 2 hours from Saint Malo. Brittany Ferries Operate this route and we tend to go via Portsmouth to Saint Malo as drive is shorter for us on British side if going to Portsmouth. The sea cat also operates from Portsmouth to Saint Malo. Fly to Brest (one and a half hour’s drive away) or Dinard (2 hours away).Ryanair, Flybe. From Paris – five hours drive (N12 via Rennes and Saint Brieuc), or train, tgv - four and a half hours to Guingamp, twenty minute drive to Perros. The house is situated above the Trestraou beach which is one of Brittanys finest. There are several shops, cafes and bars next to the beach which is a five minute walk away from the house while a 2 minute drive leads to the main town. Contact Debbie Quinn for Enquiries and Availability.